The agility classes at SPDTC are designed to be taken in a specific sequence to better prepare teams for a safe and long term participation in the sport of agility. Each team is moved up the class progression based on their performance and instructor's assessment of how the team is doing. Participation in the Beginners through Advanced classes is subject to an assessment by the instructor. 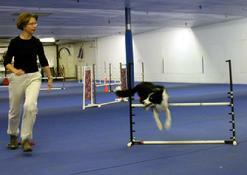 Class sizes and skill level dictates which class you and your dog may be placed in. See the club calendar for schedule details. Please note, SPDTC does not offer private agility lessons. Please Note: Puppy Classes at Saint Paul Dog Training Club are open to dogs at 8 weeks of age. We require that all puppies participate in a vaccination protocol developed and overseen by a practicing veterinarian, and generally in compliance with the American Animal Hospital Association guidelines for dogs. Owners will be required to provide evidence of a vet visit and vaccination plan/history at the first class. If your puppy shows signs of illness, please do not bring it to class. For more information see the PDF article “The Dilemma of Socialization and Immunity” by club member John Scandurra, DVM. For more information on any agility classes or for general information about the agility program, contact Agility@spdtc.com. If you’re already an agility student at SPDTC, please see your instructor for information on your next agility class, or email the director of agility for information. You don’t need to register for your next class online. 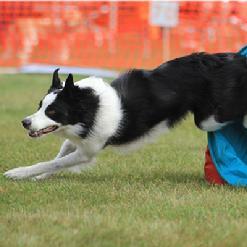 Get your dog introduced to the basics of agility obstacle performance. A great way to see if agility is for you! Build a solid agility foundation with your dog by working on attention, confidence builders, coordination, balance work, play and drive. 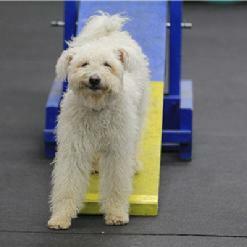 The class will introduce ground level agility equipment and ground level to very low jumps. Targeting and clicker training will be emphasized. Prerequisite: (2) levels of Basic Obedience Skills. Handlers must demonstrate the ability to control and work with their dogs off leash to enroll in this class. Classes are on Thursday @ 7:15 p.m. Cost: Foundations of Agility is $170 per 10 week block. Beginner class builds upon the skills learned in Foundations II. The class includes continued instruction on the weaves, improvement upon handling skills, and increased distance and independence in handling. Classes are on Mondays @ 7:40 p.m. Cost: Beginner classes are $170 per 10 week block. Intermediate classes provide instruction in more advanced handling techniques and more advanced sequences. Skills we work on include: crosses, threadles, serpentines, discriminations, and distance work. Classes are on Mondays @ 6:30 p.m. Cost: Intermediate classes are $170 per 10 week block. For teams just getting started in competition, this class will focus on building the relationship and mindset that will lead to a successful Agility career for you and your dog. Special emphasis is given to the problems of “high drive” teams, where handlers and dogs struggle to understand each other. Prerequisites: The dog must execute all obstacles with a good level of independence. Teams should be in competition or nearly ready to compete. 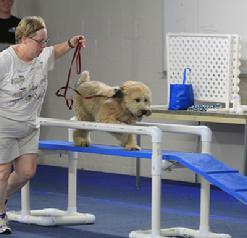 Permission of the Agility Director is required for this class. Classes are on Wednesday @ 8:30 p.m. Cost: Advanced classes are $170 per 10 week block. 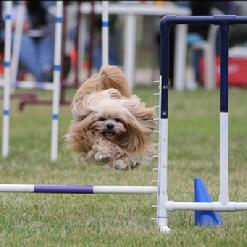 For the serious agility competitor, this class will focus on creating a winning team through learning advanced handling techniques and course strategy. Individual instructor feedback will be provided to each team. Full course nights occur periodically to allow practice in situation more similar to a trial setting. Prerequisite: proficient at all equipment and all ground work. There are 3 Masters classes, one on Wednesday @ 6:15, and another at 7:20 on Wedenseday and the 3rd class is on Thursday at 4:30. Cost: Masters classes are $170 per 10 week block. This class focuses on short, difficult sequences and training drills that will extend the skill set of the handler and dog. Alternatives in handling will be considered, and students are encouraged to get out of their comfort zone and consider new possibilities and techniques. Prerequisite: The dog must be proficient with all the obstacles. Permission of the Agility Director is required for this class. Classes are on Thursdays @ 6:00pm. Cost: Skills & Drills classes are $170 per 10 week block.